We have updated a couple of our top picks based on reader feedback. If you are looking for a heated throw blanket for snuggling up on the couch while watching TV or while sitting at a desk, look no further. Electric throws are just smaller versions of a traditional electric blanket that is perfect for wrapping around yourself. These days they come in incredibly soft materials that will keep you warm and happy on the coldest winter nights. The electric blankets of today are wonderfully high tech using thin wires, digital displays with better safety features and, in some cases, low voltage. They also use flexible and comfortable materials that are a world away from the heated blankets of the past. There are a lot of quality throws to choose from, so we have found the most popular and best-reviewed products based on consumer feedback, expert reviews and many hours of research. Our top picks are based on many factors including features, safety, how quickly they heat up, how well they stand up to washing and aesthetic appeal. One of the best options if you want a quality heated throw from a top brand is the Sunbeam Microplush Heated Throw. 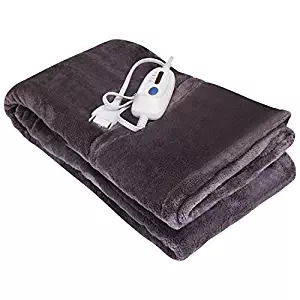 It has all of the standard features that you want in a high quality heated throw including a three-hour auto -shut off, even heating with no hot spots and soft, warm fabric. Another plus to this blanket is that Sunbeam uses something they call a ‘ThermoFine Warming System,’ which allows the product to adjust to body and room temperatures. This Sunbeam throw comes in a wide array of attractive colors and it also holds up well to multiple washing and extended use. The Utopia Bedding option is a great, all around throw for an affordable price. It will keep you warm and cozy and is useable on your bed or when relaxing on the couch. The size is 50 inches wide and 60 inches long, which is slightly longer than some other throw options. The material is a micro mink, so it is super soft while at the same time being very lightweight. Currently, it only comes in a gray color. 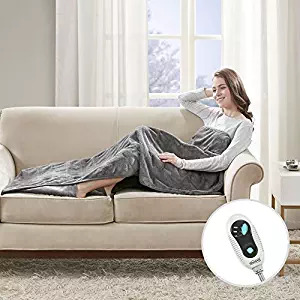 Some users find that it doesn’t warm up quite as much as they would like, but for most people, this is a good design if you want a lightweight, comfortable blanket that will keep you warm while relaxing, but not overpower you with heat. One of the great features of a throw is that they are shorter than a traditional blanket, so they are great for using on the sofa, but if you get cold feet it can be challenging to find a throw that covers your feet if you want to stretch out. Beautyrest has solved this problem by introducing a throw with a foot pocket, so now it is extra easy to keep your feet warm. It comes with a 3-setting heat controller, the size is 52″ x 62″, and it has a 2 hours auto shutoff. This design was introduced in 2018, so it has the latest electric blanket technology, including no electromagnetic field emissions. Some throws feel a little more luxurious than others, and the Sunbeam Faux Fur Heated Throw is one of the best if you are looking for pure luxury and comfort. It is a slightly bulky, but super warm and cozy design that is great for keeping you warm in the depths of winter. It’s main selling points is the faux fur material and the sherpa lining. If you are looking to spoil someone special this blanket is highly recommended as a great gift. It comes with a controller that lights up with three heat settings and a 3-hr auto shutoff. 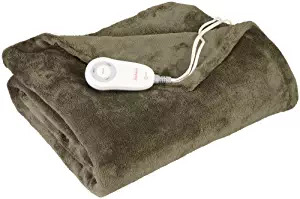 A lot of people love the idea of an electric blanket but are concerned about health issues that may arise from exposure to electromagnetic field emissions. 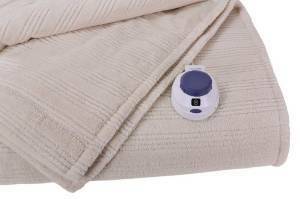 The Soft Heat Luxury Micro-Fleece Low-Voltage Electric Heated Throw helps to cut down on health concerns as it uses low voltage technology. It has a single control with a 10-hour auto shut off, and the size is 45-by-60 inches. This style is soft and comfy with ultra-thin wires that you will barely be able to feel. 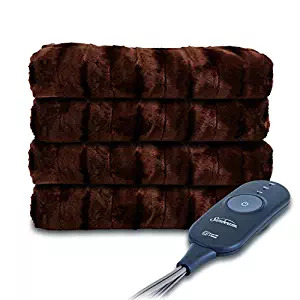 A lot of people already know that electric blankets can be a fantastic investment to help stay warm in the cold weather while snuggled up in your bed. Really good heated bedding will keep you warm, save you money on energy costs, and help with aches and pains while in bed. What a lot of people don’t realize is that that you can get wonderfully luxurious heated throws that are perfect for warming up while watching TV or working at a desk. 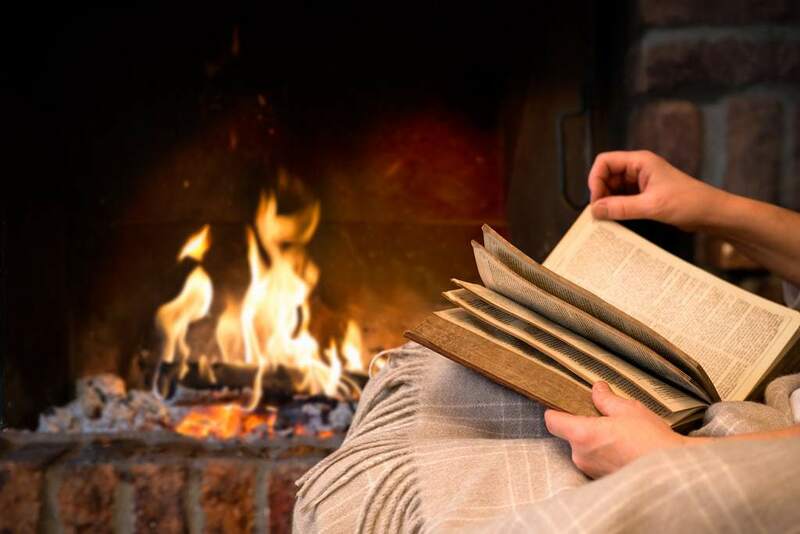 Most heated throws are much smaller than a full sized blanket at approximately 60 inches by 50 inches; they also tend to have fewer settings and will turn off after 3 hours rather than the standard 10 hours of a full size. They come in a variety of material including micro plush, velvet plush, fleece, and faux fur. You can also get them in a large number of colors and patterns so that you can find the perfect one for your home’s decor. Before you buy a heated throw, there are a few things that you need to be aware of to avoid disappointment with your purchase. The most important thing that you should know when buying any heated bedding is that there is a very high failure rate on these products. What this means is that there is some risk you will get a dud blanket that won’t work. Because of this, you need to be aware of the return policy and warranty of the product, because there is a good chance you may need it. Most of the blankets will work perfectly well, and you will love them when they do and wonder how you ever lived without one. However, for the few customers who unfortunately end up with faulty products, there are a couple of things you need to do to protect your investment. First, as soon as you get the throw you should try it out, don’t wait. Most stores have a 30 or 60-day return policy, and it is far easier to return a product to a store within the return window than trying to return it to a manufacturer on the warranty. So if it isn’t working, you will want to know as soon as possible. If the blanket requires that you register it for the warranty, do this. It is very common for heated bedding to stop working after a couple of months. Also keep a copy of your bill of sale/receipt. If the throw is faulty, you may have to jump through a couple of hoops with the manufacturer to prove that the problem is with the product, and not with how you used it. Read the washing instructions carefully. It is also essential to read the manual especially the section on blinking lights or error message. Having a heated throw can be a fantastic luxury; since they are so cozy and comfortable, they will improve your quality of life. However, a lot of people are hesitant to purchase any electric bedding due to concerns about cancer risk or the idea that they are fire hazards. The idea that electric blankets are a risk to your health stems from the worry over being exposed to electromagnetic fields (EMFs). EMFs are a form of non-ionizing radiation, and along with extremely low frequency (ELF), EMFs are produced by things like power lines, and electrical appliances including heated bedding. Some early studies raised the possibility of an association between certain cancers, especially childhood cancers, and ELF-EMFs. Most studies in recent years have not been able to find an association between some diseases and EMFs, but it is still being investigated as to whether there is a possible link. If you are worried about EMFs, there are throws, electric blankets and heated mattress pad produced by Soft Heat that uses a low voltage of 12 to 24 volts instead of the 120 volts of a current of standard heated throws. The primary fire risk is associated with older electric blankets. The blankets on the market today all have safety protection systems that will automatically shut off if the product becomes unsafe. The companies who make heated devices know that customers are concerned with blankets being fire hazards and have improved the technology and warning systems of heated devices in the last few years, generally if the bedding is getting too hot, the blanket will shut off on its own. As with most products, there is a specific lifespan that you can expect your blanket to last for. With normal wear and reasonable care including washing and drying, you should expect your throw to last at least five years. As with any electrical device you need to keep a close eye on any damage to the fabric, controller and the plug if you see any damage discontinue using immediately. Controller- Throws either come with a digital controller or analog control. The difference is that one uses a dial to set the heat level while the other uses digital buttons. One consumer review site found that in their testing most people preferred dial controls over buttons since they are easier to use. Material and colors -Since there is a good chance you will be leaving the throw on your couch you will want to pay close attention to the appearance of the throw. Along with the softness and comfort of a material that will work well for you. Warranty Length – Warranties from the major brands can run anywhere from 1 year to 5 years. For a heated throw, it would be a good idea to check the length of the warranty before purchasing (the longer, the better obvious) due to the high failure rate of the product. When you make your purchase, make sure you register the product with the manufacturer, this will make it easier if you have to use the warranty. Warm up time – The big brands don’t tend to list specifics on how fast their products warm up, but this is a significant consideration for people. You want to get a throw that takes no longer than about five minutes to warm up, see our reviews for more details about particular products warm-up times. Price – As with most things, you get what you pay for, this does apply to heated products. The more expensive blankets often come with more extended warranties and more luxurious fabrics. Generally, the price range from the cheapest throw to the most expensive isn’t that large. To get a good quality product, expect to pay somewhere in the $100 range. A budget blanket will be around $50. The prices drip in the warmer month so you can look around for sales, but as mentioned above make sure you try out the throw in case it doesn’t work, and you need to return it. While you may hesitate to spend $100 on a blanket, you will recoup that money with saving from lowering the thermostat in your home. Length of the power cord is a consideration depending on where you are planning on using the throw and if you have a power outlet nearby. Keep in mind that you shouldn’t use an extension cord with heated bedding so having a reasonable length of power cord is a feature to consider. The number of heat settings– For throws, the standard is to have three heat settings. Electric blanket owners out there might be a little surprised by this. Full-sized blankets tend to have at least ten heat settings. Low Voltage– Since there is still a lot of concern by consumers over EMFs and cancer risk; there is the option of getting a low voltage blanket that works on 12 to 24 volts rather than the standard 110-120 volts of most throws. Perfect Fit Industries have some low voltage products put out under the Soft Heat brand name. Is it easy to store? Some throws are bulkier than others and need a little bit more room to store; this may be a consideration if you have limited storage. Who Should not be Using Electric Throws? The big manufacturers like Sunbeam say that generally, most people can use these types of warming products with a few exclusions. Infants, young children, anyone who is disabled, people with paraplegia, quadriplegics, people who have diabetes, people with pacemakers, anyone insensitive to heat who cannot clearly understand the instructions and operate the controls is not recommended to use heated devices. Further to this, people with oxygen tanks are not supposed to use heated bedding, in case the controller overheats and causes sparks. When Should you not use a Heated Throw? There are a few safety warning about when you should not be using a heated throw that may not be immediately obvious to people. You never want to use them with any furniture that is subject to movements like rocking chairs, recliners or chairs with casters or wheels. It is also recommended that they are not used with water beds. The other important thing to remember is that you should never use them with other electrically heated products like a blanket, mattress pad or another throw. As mentioned above, since there is a high failure rate of heated products you will want to buy from a company with an outstanding customer service reputation. If you are reading reviews for a particular product you should pay attention to pay particular attention to companies that honor the warranty, how easy is it to get replacement parts and how easy is it to get in touch with a company. Sunbeam: Sunbeam has an excellent customer service reputation. All of their instruction manuals are available and easy to find on their website (in case you lose yours). You can contact customer service through a form on their site or by calling 1-800-667-8623 (U.S) or 1- 800-667-8623(Canada). You can order replacement controllers by contacting customer service. Biddeford: Biddeford also has an excellent customer service reputation, although some customers have complained about having trouble getting through to them on their toll-free number. You can reach their customer service department at 1-800-789-6441 from 8 am – 5 pm Central Time. The obvious benefit of an electric throw is that it is going to keep you warm. Whether you keep your thermostat low or feel the cold more than most, a throw will keep you warm and cozy while away from your bed and help you to save you money on your energy bill. They can also help alleviate the pain of arthritis, fibromyalgia or sore muscles. It is crucial that you read through your manual and follow all of the instruction in it. Since it is an electrical product, there are some risks to using it that you should be aware of. Never use the blanket if the cords are damaged; this may lead to overheating. Don’t tuck in, pinch or expose the heating wire. Also never tuck any part of the throw into a couch or other furniture. You should be able to see all parts of the throw, controller and cord at all times. When you aren’t using it, unplug it. Remember to only use it on an AC supply current of 110-120 volts. Don’t let it get bunched up when using or you will end up getting hot spots. Don’t let your pets on the throw; they may damage it or get injured themselves. (There are some heated pet beds available from a company called K&H Manufacturing if you are worried about keeping your animals safely). Most throws are washable, but before washing it is very important that you read the care and cleaning instruction, you can find in your manual very carefully. They do tend to have a long list of warnings, so they are essential to go through. If you don’t follow the washing instructions, your heated product might shrink and could cause a fire hazard. Electric throws are an excellent product to invest in. The initial cost may be a bit painful, but you will save money in the long run through lower energy costs. Modern fabrics and technology are super comfortable, easy to clean and are an absolute dream to snuggle up under on a cold winter’s night. Manufacturers have addressed the safety concerns of the previous generation of electrical products, so along with new safety features and with reasonable care and maintenance on the part of the consumer that you would follow using any electrical products the risk of creating a fire hazard is minimal. Give one a try; once you get hooked, you will wonder how you ever lived without one.